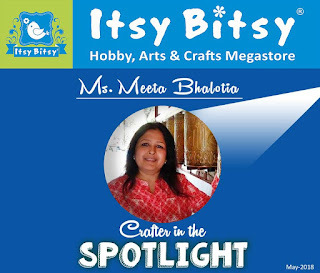 I am here with an awesome news that I have been selected as 'Crafter in the Spotlight' by the premium craft store Itsy Bitsy India.. So here is the project I made for the same with a pictorial tutorial. Here is the step by step tutorial for the multipurpose stand. Anything can be kept in it like stationary items, cutlery or even remotes. I took a mdf stand with three partitions and the Vintage Rose Tissue napkin. I divided the stand in three parts with pencil. I masked the stand and applied Little Birdie Muted Teal chalk paint on the unmasked area. Now I took the tissue napkin and cut them in several pieces according to the design I want to place. Always remove the white backing paper from the tissue, be careful. With the help of a stencil and Little Birdie 2 in 1 mixed media paste I gave the stand a little embossed effect. I gave the design randomly on all sides of the stand. After applying the paste on the stencil I removed the stencil and heat set it with Little Birdie Heat tool. I stamped little flourishes here and there to make the design look complete. I then applied VersaCraft Pale Aqua on the edges and the top. I applied Little Birdie Varnish Gloss all over and dried it. I gave 2 coats of it to cover all areas. Please do let me know how you liked it. fantastic your tutorial. Love your project. Thanks for joining us at Crafty Sentiments Designs this week. Thank you for sharing this gorgeous project with us at Altered Eclectics, so pretty. Also thanks for showing us how it was done, it's always good to see the process and learn new things.